There’s lots of good reasons to take your car on holiday with you if you’re travelling to continental Europe or even further afield, and Ontime’s global automotive transport services can get it out there for you if you don’t want to drive it there yourself. Having your own car gives you an extra degree of freedom – you’re not tied into a restrictive hire car agreement and you don’t face punishing excesses if you’re involved in any kind of incident while out on the roads. You also benefit from having a familiar vehicle to drive, and while that might mean you end up driving a right-hand drive car on the right-hand side of the road, many people prefer this to hiring a left-hand drive vehicle and having to cope with the controls being reversed as well. But what happens if your car breaks down while you are abroad? Many domestic UK car insurance policies do not offer full cover if you take your car out of the country – and that can leave you facing substantial repair costs to get your vehicle up and running again. Repair or repatriate a broken down car? The main decision you face is this: is it more economical to recover and repair the car in a foreign country or should you repatriate it first? It might depend on the value of the car – luxury, classic cars and sports cars all have extra reasons why it’s sensible to repatriate them before carrying out the work, whether it’s to make sure you have access to the right parts, or so that you can feel more confident about the quality of the work carried out. You might simply want to avoid the language barrier, particularly when it comes to negotiations over the cost of the work done on your vehicle, or any additional work that the mechanic claims needs to be done during the course of the repairs. 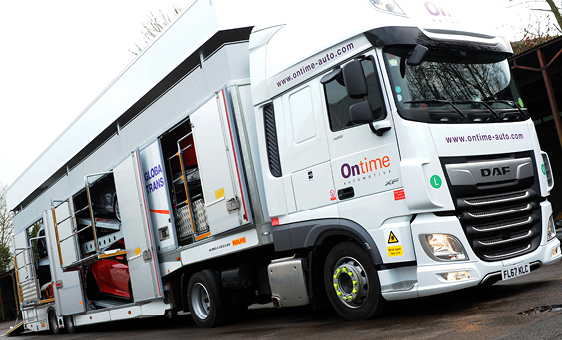 Ontime are experienced in shipping vehicles over long distances, as our global automotive transport services division regularly moves cars between locations all over the world – and we can help with emergency car repatriation too. Because we use fully enclosed car transporters, your vehicle does not need to be in working order to be transported home, and will not be exposed to any further damage due to the weather or substances like grit or salt that can be thrown up from the road surface. We have equipment to safely and securely load a non-running vehicle onto our transporters, so again, there’s no need to start the engine in order to do so. All of this means that if you break down abroad, you can get your vehicle brought back to the UK for repairs, without exposing it to further damage, and without adding extra miles to the clock by towing it over long distances. To find out more, contact Ontime today, so that you always have our number close to hand in the event of a breakdown anywhere in the world.